Buffalo Jenn, such a sweet comment yesterday! She is the most tender-hearted girl. I always remember when I was out in California and I had to take the plunge and start reading my book to Leonard Pennario, and it went well, and I got this comment from Buffalo Jenn: "Awesome job." That still makes me smile. And when I had that extremely odd experience when I drove to the wilds of Tonawanda to pick up that ancient hi-fi and they were playing Pennario's Chopin waltzes, wasn't that Jenn telling me she thought it was Leonard saying hello? I am really feeling good these days. 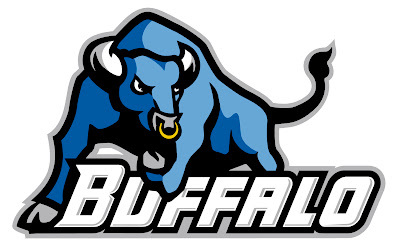 It is not only because of Buffalo Jenn but because of the UB Bulls. How about those UB Bulls? Stampeding to victory! I am a UB girl, I may as well admit that. And of course David Letterman has to go and slam us. Some dumb joke about not being able to spell Buffalo. Well, I am affectionate about Letterman even though we do not agree on anything. I remember when he was young and cute and women were stalking him. Remember when David Letterman had that stalker? He was just about the first person I remember being stalked. He ushered in that fad. I bet people stalked Pennario. I mean, look at me. I stalked him, before he came to Buffalo last fall. I called him once to interview him and I had such a good time with him that I decided talking to him just one hour wasn't enough, and when I was having a tough day a week later I called him again. I made up some excuse. Then I called him a couple of days after that. That time I did not even bother to pretend I was working. Then the day after that I had this conversation with Jeff Simon at the computer printer. Jeff Simon is our arts editor and I love him so I tend to vent to him. 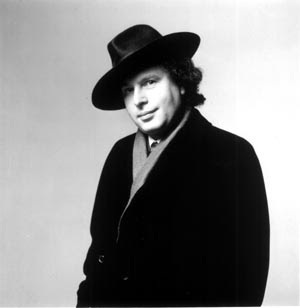 This particular day I was kvetching because I had to interview this other pianist, Andras Schiff. And all Schiff would do was an email interview. Not only that, but you had to buzz the questions over to some intermediary, who in turn passed the questions on to him! And, I mean, I had been honored to talk to a million musicians including Van Cliburn, Gary Graffman, Andre Watts, whoever. I will not even get into the violinists. I will just say that nobody puts you through this email business. No one gives you this kind of trouble. That was what I was whining about to Jeff at the printer. And Jeff said, "Well, people get worried." Something like that. "Worried about what?" I said. "Well, they don't know who is calling them up. They worry that person could turn into some kind of problem." "That's ridiculous," I said. "I'm a professional. I would never--"
Then I remembered Pennario! I mean, I had called him three times! He did not act as if he was bothered by it -- in the third phone call, he even let me do my imitation of Joan Fontaine in "Rebecca," where she says, "Sometimes I do go back to Manderley..."
But what if he was bothered and he did not show it? What if I were stalking him and I did not know it? Listen to me, one more rhyme and I'll really be a poet! ... but still he is not the kind of guy you would stalk. There is one real stalker and that is Ron Moss. Back when he drove a cab he used to call his fares the next day. Howard has told me about that. Moss is the stalkers' stalker, Howard has said. "Yeah, this is Ron," Moss would say. "I drove you home lastnight." And people would flip out. Moss will be able to do that again once he gets back in the saddle as our driver for the Grim Reaper ride service.